A true ‘rescue mission’ to stop the needless replacement of a perfectly good quality floor. The client had a solid Walnut floor in their dining room and also in their hallway – both laid about four years before. The planks had been properly installed and were suitable for both rooms, but the floor had been almost damaged beyond repair by a botched ‘restoration’ carried out by people with no idea of how to sand a floor! Find out more beneath the photos. 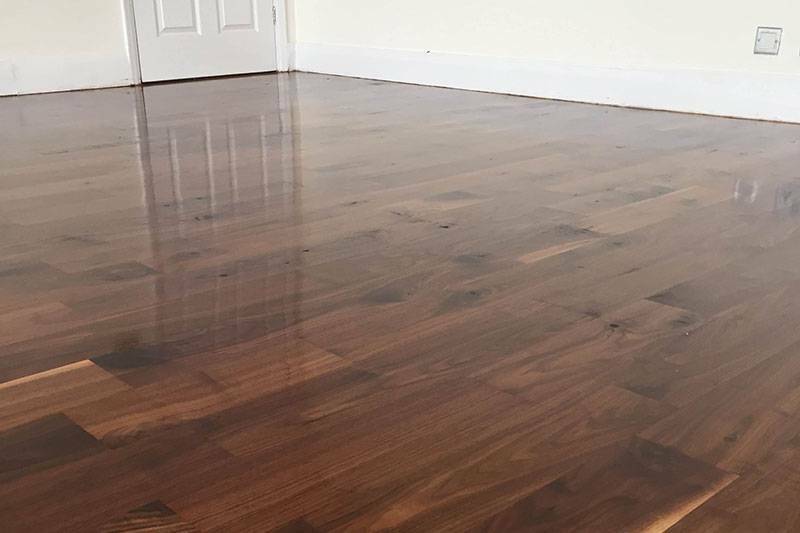 This project is a perfect example of a home or business owner needing their floor restored, and trusting a tradesman who says ‘Yes – of course I can do that’ – when unfortunately that tradesman has no clue at all what they are doing. The customer came into our showroom wanting advice on what to do to her floor. 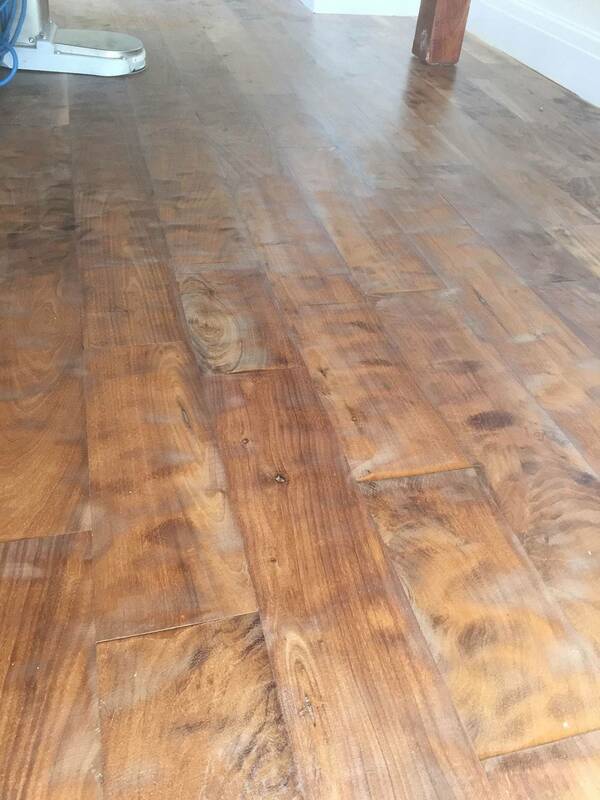 She was so unhappy with its condition that she initially asked us to rip it out from both rooms altogether, and replace with a new floor using a cheaper wood species. When our founder Mursel saw the condition of the floor, he was speechless! 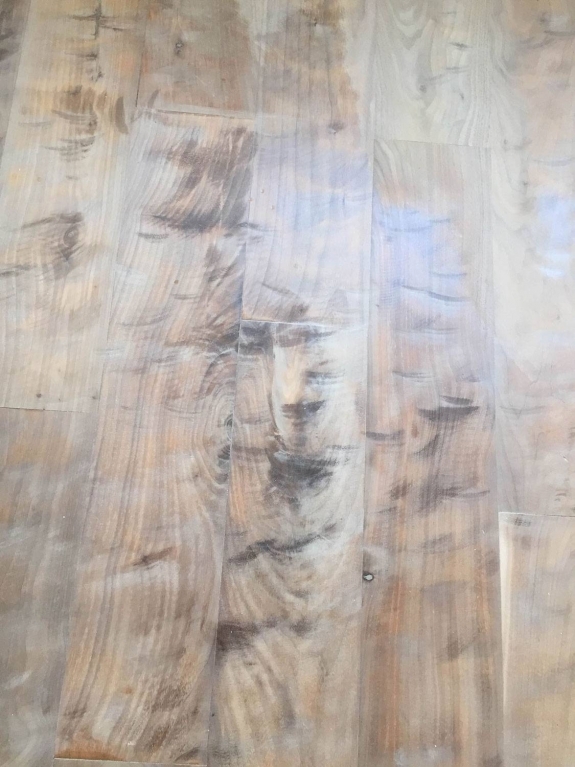 If you look at the three small photos above you could be forgiven for thinking that the customer had asked for some sort of distressed or worn look, rather than what she’d actually asked for: sanding to give her floor a level surface. The wood had dents everywhere – some up to 4mm deep – and there were sanding lines all over the place. The customer explained to us that the floor had been sanded by builders who did some exterior work for her. She was happy with that work, and so she had asked them if they could sand and re-oil (or varnish) her floor. They assured her that they were capable of doing this. Unfortunately, they were most certainly not up to the job. The customer told us that they had used one hand-held sanding tool only for the whole job (so no extractor of any kind), and that the whole house had been filled with dust. She had to leave all her windows open whilst they were working, and then have a deep clean after they had finished. Walnut is a beautiful wood, and at heart the floor was still sound. We could have supplied a new floor, but this would have been such a waste. 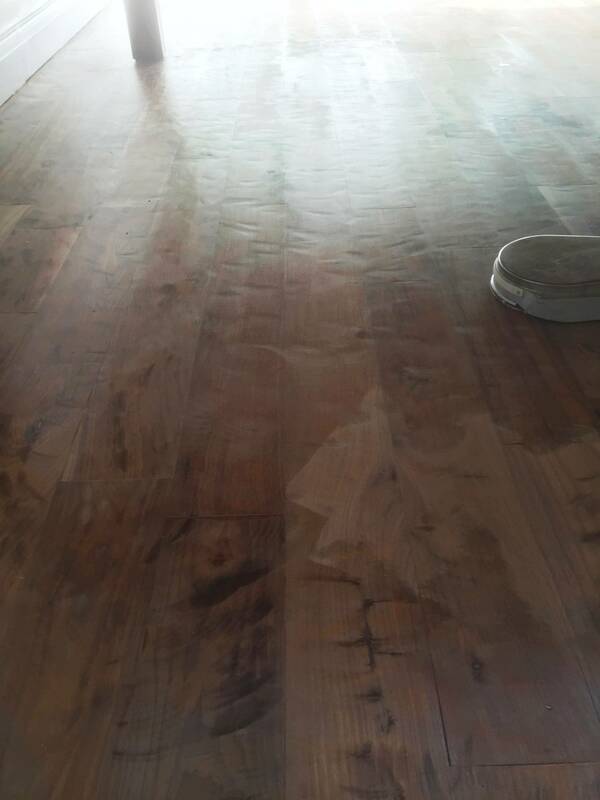 Due to the deep dents we had to sand the Walnut down with quite rough sanding paper to begin with, gradually using finer grades to level off to a flat surface. It was lucky that the planks were solid and therefore some 20mm thick: if the floor had been engineered (where the to layer is typically 5mm or 6mm) we would not have been able to rescue the floor. You can read about the difference between solid and engineered floors here. Following the restoration of an even surface we applied to two coats of clear hard wax oil. Read more about our finishing options here. Two people. Normally this kind of project would take one day of sanding and one day to apply the finish. However here, due to the extreme damage inflicted on the wood, it took three days of sanding and one day of applying the finish.